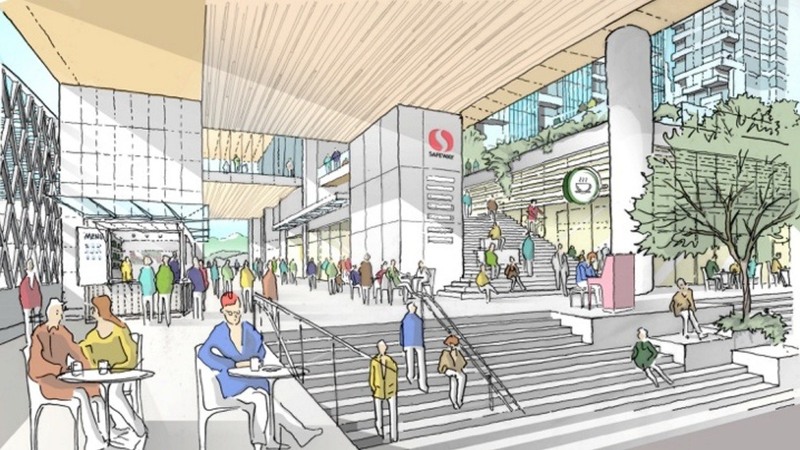 If it is built as planned, the mixed-use redevelopment of the Safeway grocery store site next to Commercial-Broadway Station in East Vancouver will be one of largest single redevelopments next to SkyTrain within city boundaries outside of the downtown core. The much-anticipated project at 1780 East Broadway is a partnership between local developer Westbank and Crombie REIT, which owns Safeway locations in Western Canada. It is also one of the last projects influenced by late local architect Bing Thom, whose namesake firm has carried on with his work. 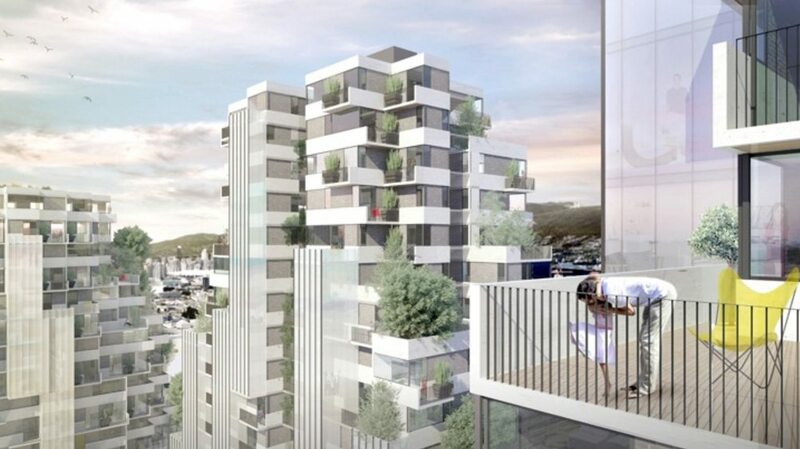 Preliminary conceptual designs for the redevelopment show an irregular pattern of stacked boxes. 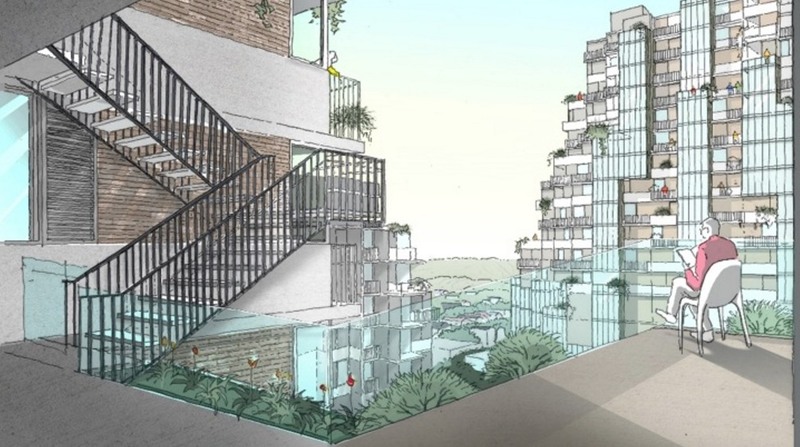 There will be four residential towers – 11 storeys, 17 storeys, 21 storeys, and 24 storeys – on top of a two-storey commercial podium. 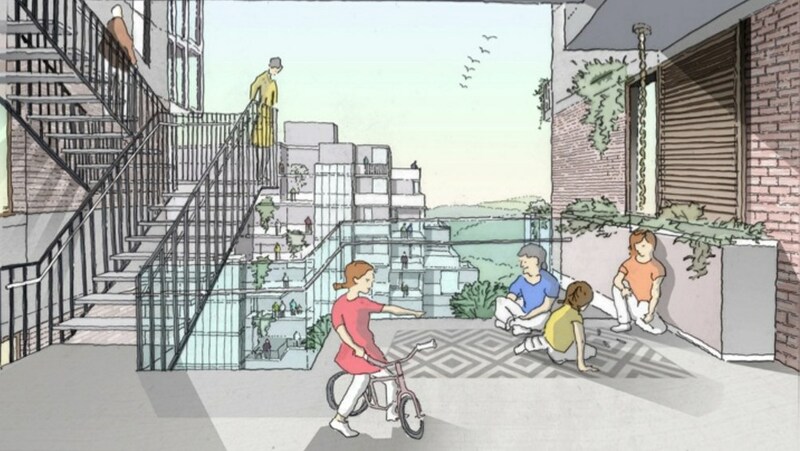 “We are exploring a building typology that creates a vertical village encouraging social interaction, providing usable semi-private spaces, and more diverse units,” reads the architect’s design rationale. A total of 649 residential units, comprised of a mix of market condominiums and affordable rentals, are proposed. The podium will house a new replacement 56,000 sq. ft. Safeway, 50,000 sq. ft. of office space, a 70-space daycare, 11,200 sq. ft. of retail, and a covered public breezeway that connects East Broadway and East 10th Avenue and provides pop-up retail opportunities. To support the activity spurred by the complex, there will be a total of 524 vehicle parking spaces – 218 spaces for residents and 306 for businesses – and 971 bike parking spaces. The project also promises 22,000 sq. ft. of on-site public space, including a children’s playground and a unique 42-step grand public staircase next to the East 10th Avenue entrance of the SkyTrain station. 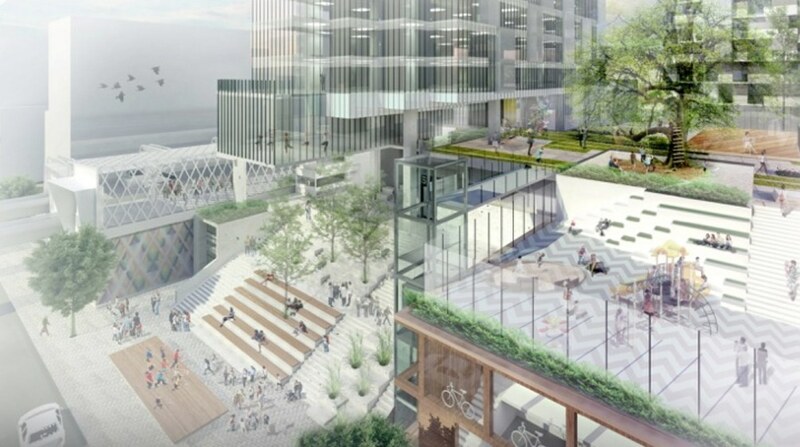 Separate from the public spaces, a large private internal courtyard on the rooftop of the podium for the building’s residences is planned. 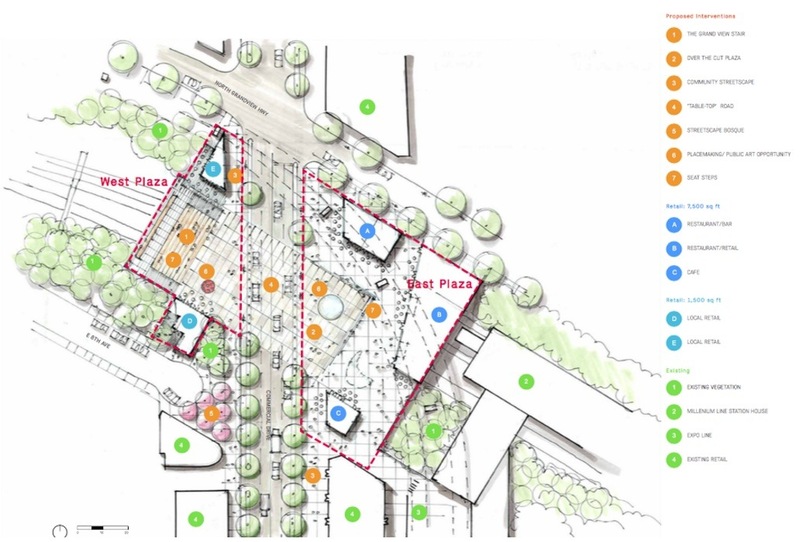 These on-site public spaces are in addition to the proposed community amenity contribution of a developer-funded public plaza over the Grandview Cut on both sides of Commercial Drive – immediately adjacent to Commercial-Broadway Station. 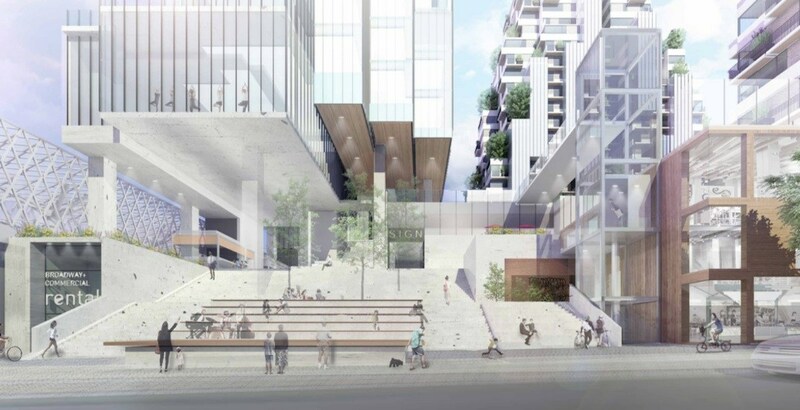 The plaza was originally envisioned to be incorporated into the on-site redevelopment, but project planners say there is a lack of space due to the construction of the fourth SkyTrain platform. 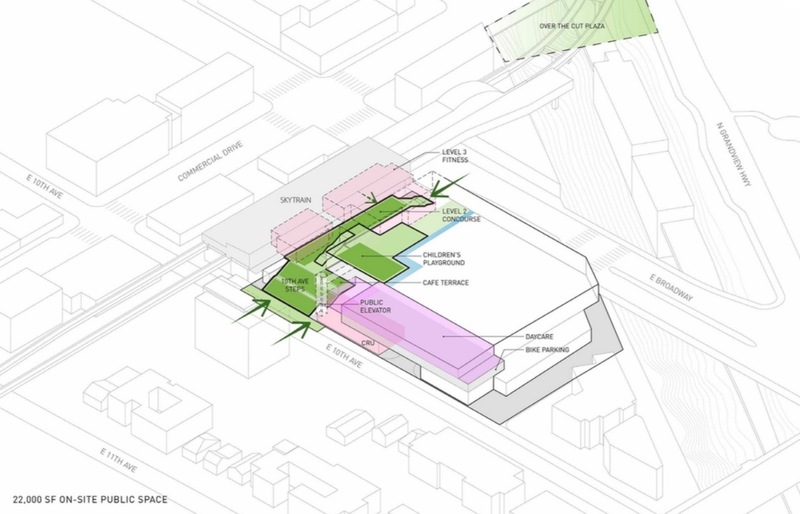 “The expanded SkyTrain platform to the east resulted in the expropriation of the western portion of the site,” reads the rationale for the plaza’s relocation. 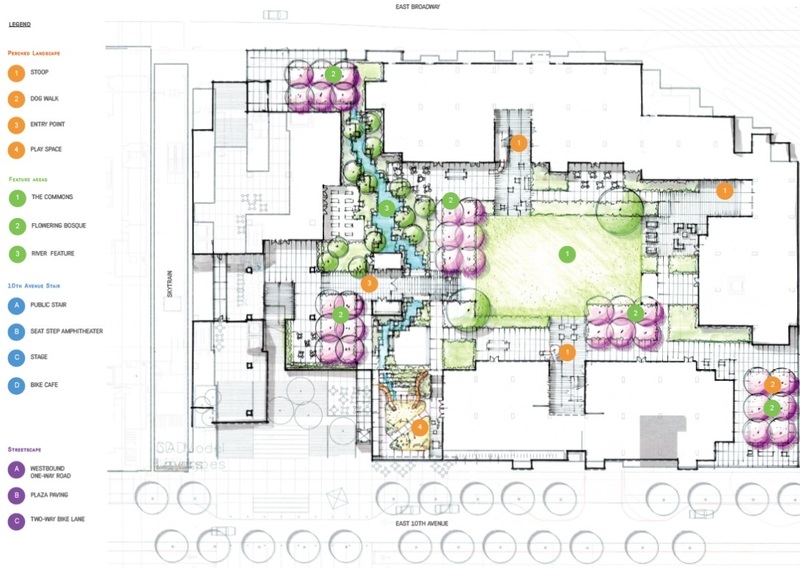 If the public plaza were located on-site, the new Safeway would have to be either smaller or a two-level store, but planners say the alternative store designs so not meet the store’s business model or operational needs. 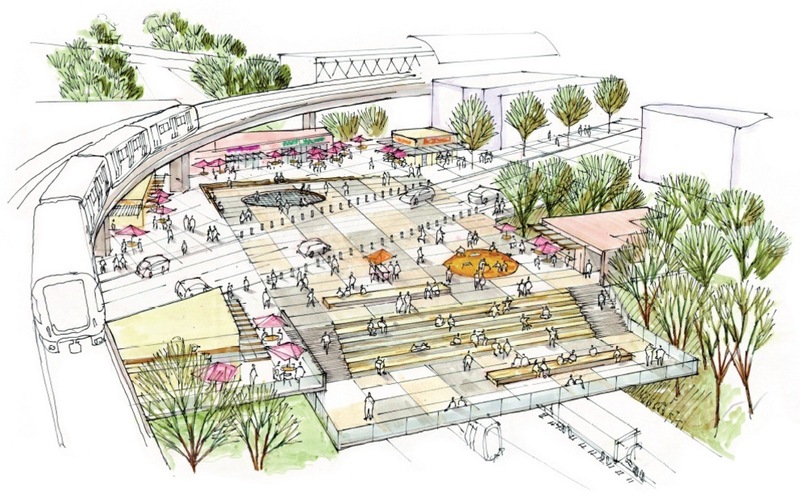 According to planners, the Grandview Cut plaza option holds more potential for the community as it will connect the north and south sections of Commercial Drive and accommodate programming and events. 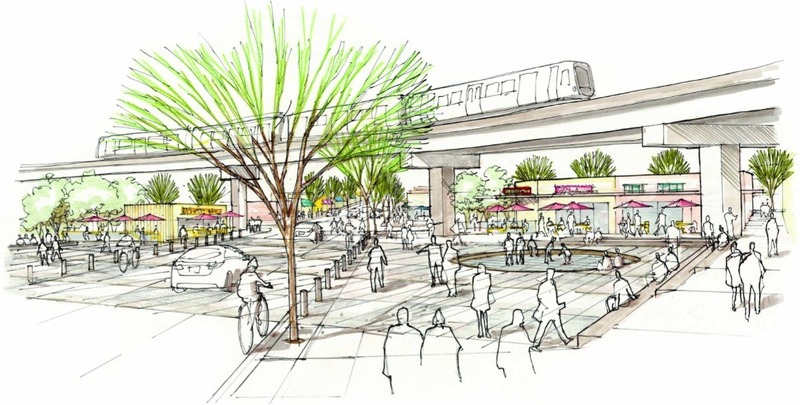 Does the project’s modest scale make sense for Metro Vancouver’s busiest SkyTrain station? While the entire redevelopment seems significant, it is far smaller and less ambitious than other transit-oriented projects in the region – even compared to Marine Gateway, which has a very significant office and retail component, such as Cineplex, T&T Supermarket, and Winners. The project’s scale is held back by not only its tight 106,000 sq. 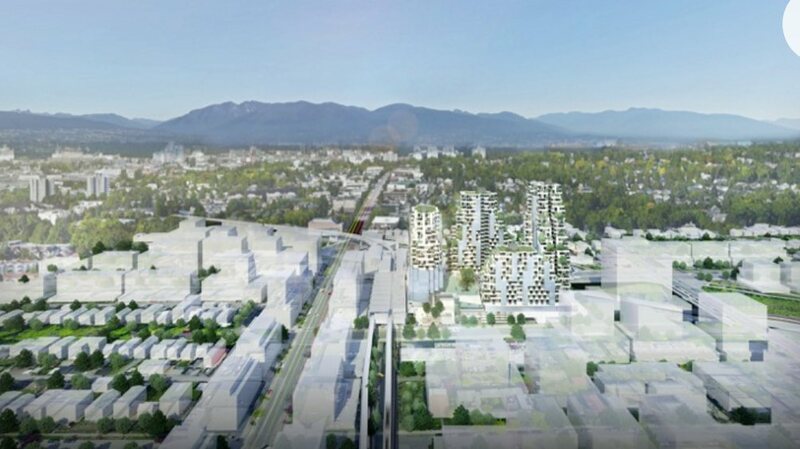 ft. footprint but also Vancouver City Council’s approved Grandview Woodland Community Plan. Previous iterations of the Community Plan called for taller towers, but the allowable heights were scaled down after neighbourhood opposition. A formal rezoning application to the municipal government with further details is anticipated shortly.